let's use our agreed upon 5 steps. 2. How did chemistry solve the problem? 3. What was the positive impact of solving this problem on society? 4. What were the negative consequences to society and environment that resulted from this solution? 5. What chemistry principles need to be learned to better understand steps 1 through 4? The problem was the extreme competition for food. 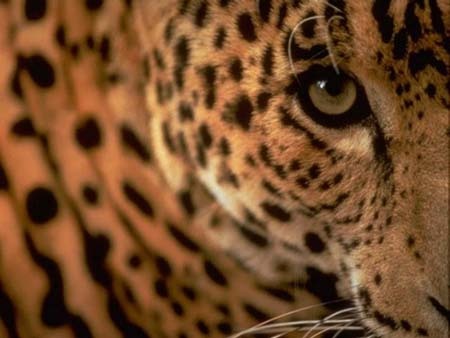 For us humans, it was hard getting food, keeping food, and not becoming food ourselves. Our competition was faster than us..
...and could easily pounce on us and eat us. and a better sense of hearing than us. 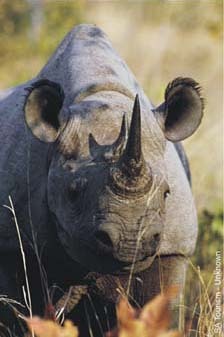 Even the slowest of our big game could out run us and gore us with their horns. The answer was first knowing which rocks (minerals) had the right physical properties to form weapons and then knowing how to apply force to these rocks in order to shape them into tools and weapons. 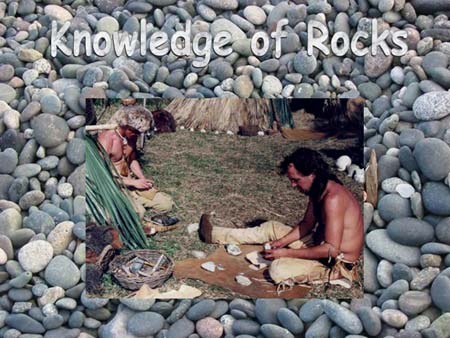 The art of shaping stones into tools or weapons is called flintknapping. 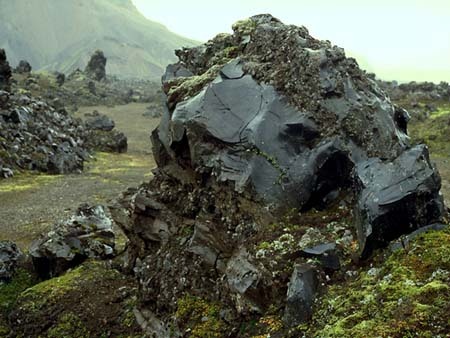 One type of rock that was learned to have good qualities for making sharp arrowheads, spears, or knives, was found near volcanos. The rock was mostly made of molten silica (sand) which is best described as a natural glass. This rock is called obsidian. 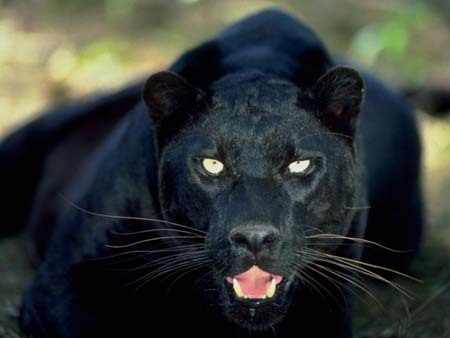 Its name comes from a Roman named Obsidius who discovered it in Ethiopia. 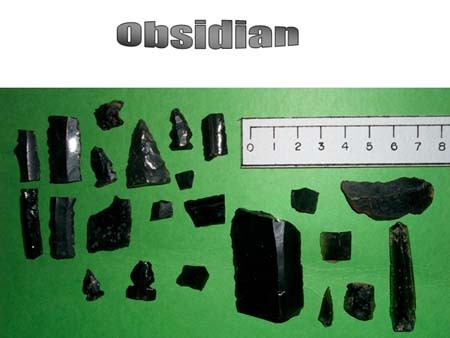 With the proper amount and angle of force, obsidian can be shaped into very sharp tools. Even today, some surgeons will use scalpels made with obsidian in eye surgery and other delicate surgeries. If you live in Arizona, you have probably seen "Apache Tears." These are polished forms of obsidian. Despite their silky smooth appearance, a primitive flintknapper could turn these into sharp arrowheads. 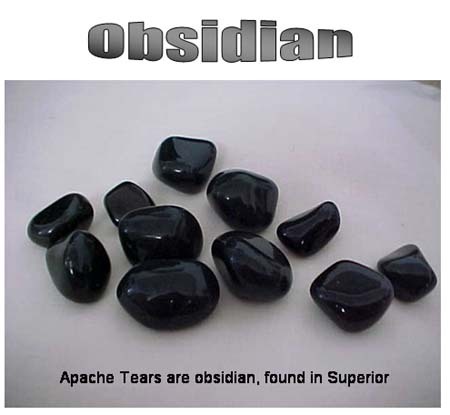 The reason obsidian can be shaped where other minerals can't is that obsidian was a molten lava which mostly consisted of silica (silicon dioxide SiO2) that cooled rapidly as it poured into water. The rapid cooling didn't allow time for crystals to form (called cryptocrystalline). 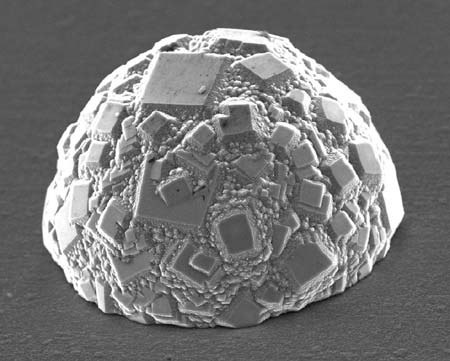 If the molten silica had time to form crystals, it would form quartz crystals that you couldn't shape, because the breaks would follow along the crystal faces. In other words, the cleavage would follow along the natural shape of the crystal. Other minerals had a similar composition to obsidian and were glass-like. So they too could be shaped. Chert, flint, and agate are a few that could be shaped. Even though stone age technology sounds primitive, it is still quite valuable. 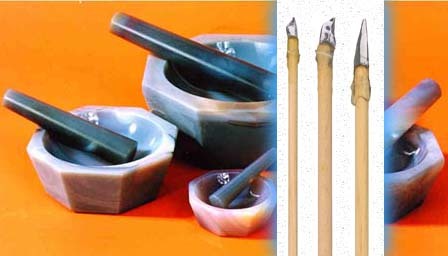 These agate mortars and pestles are quite expensive (few hundred bucks) and are superior to most of the mortars and pestles made from modern materials. 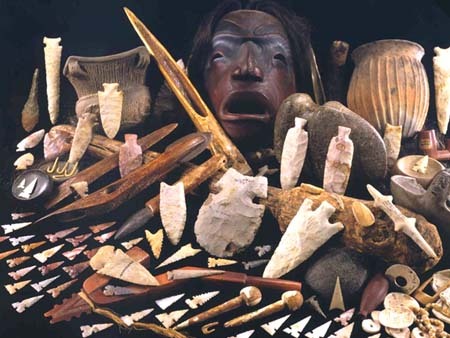 The impact of turning certain natural chemicals (glass-like minerals) into tools and weapons had a tremendous impact on the human societies. 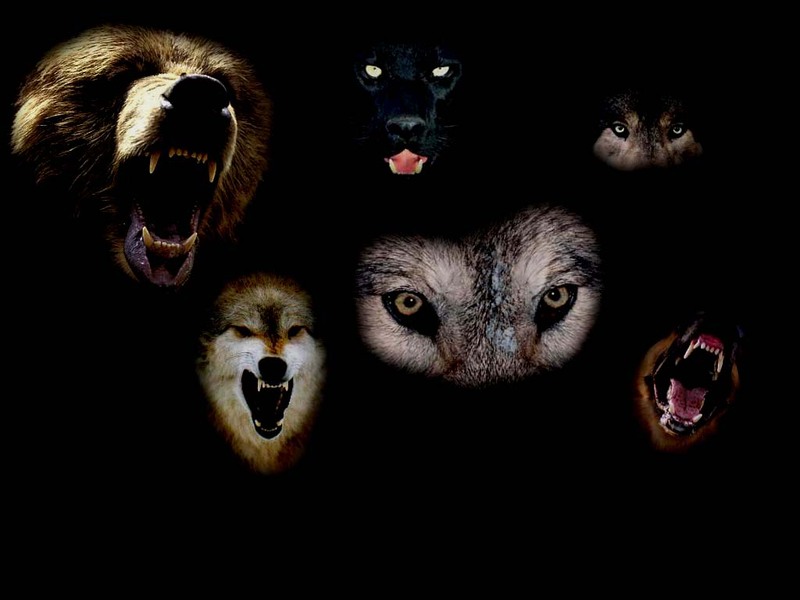 In a way it gave humans teeth and claws made of sharpened rock that could be thrown at predators or big game animals. 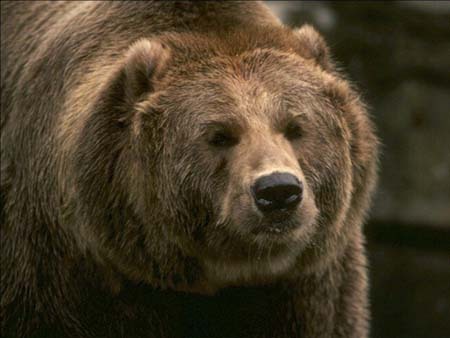 It gave humans tools to cut wood, hide, and bone. It allowed the making of of new tools like fishhooks, sewing needles, and more. In short, it allowed humans to survive. 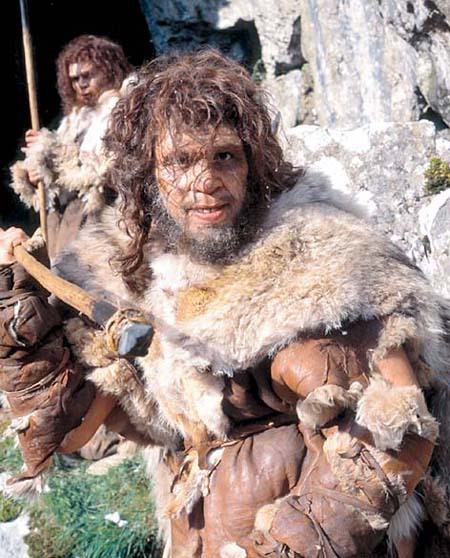 Without stone tools, humans may have gone extinct long time ago. 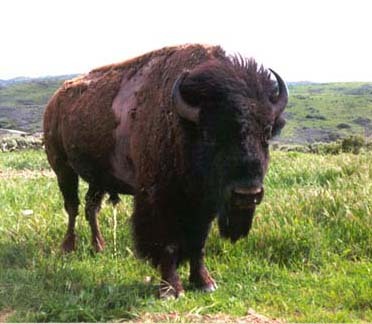 The impact on the environment was probably a reduction in animal populations since the humans were able to hunt and kill more game with these stone weapons. 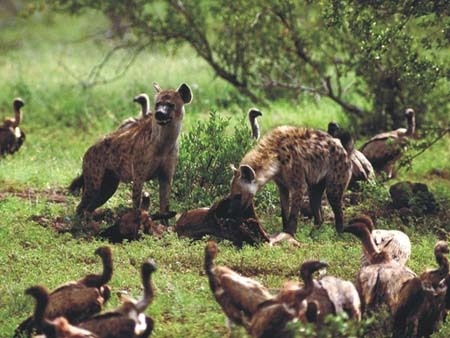 The negative consequence to society was that the weapons used to kill animals for food, could also be used to kill other humans. 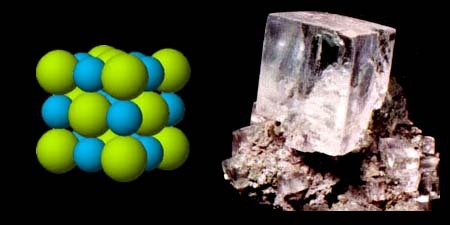 Crystals are orderly stacks of atoms. Here we see sodium atoms (blue) and chlorine atoms (green) stacked in a way that makes a microscopic cube. This cubic structure continues to grow until your eyes can actually see a cubic crystal of salt. You can't shape this crystal because when struck, the cube just breaks into smaller cubes. 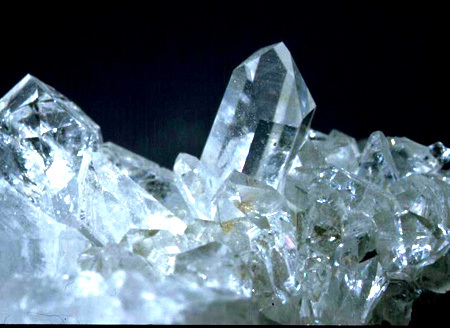 Breakage is easier along the crystal planes, which run same direction as the surface of the crystal. Now when molten rock cools very quickly, the atoms don't have time to arrange themselves into large crystals. You get many very small crystals. In this rock, breakage can go in any direction because the crystals are too small to control the direction of the break. What does control the direction of the break is the direction of the force that hits the rock. When a BB hits a glass window, a shock wave expands as it travels through the glass resulting in a a cone shape break in the glass. In a similar manner, a person can strike a suitable rock (one that contains microcrystals like obsidian, flint, & chert) and the shock wave will fracture the rock. 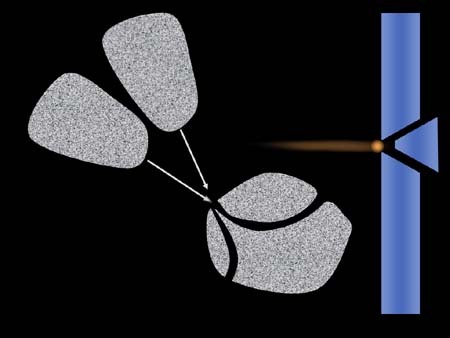 By controlling the angle of the strike, the direction of the shock wave and therefore the fracture can be controlled. This way the rock can be shaped into whatever tool or weapon is needed. 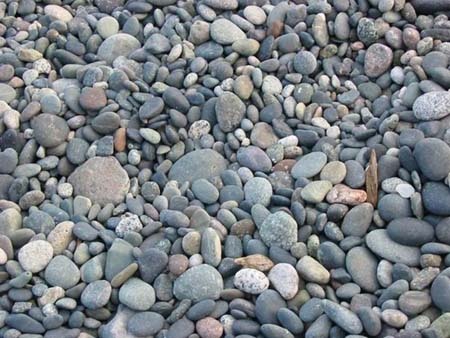 The next time you take a walk along some river rock, you can try throwing one rock against another rock and see if you find a rock that breaks like the rock in the diagram above. In a pinch where you needed something sharp to cut something and didn't have a knife, you could use one rock to break and shape another rock into an ax that could be used for cutting.